Isahak, the third child of Peerally and Kosemeea was born in the month of November 1887 in Phoenix Park, California. He was educated up to First standard level at Elementary School. At the age of ten, he worked as an office boy for a penny a day at Waterloo Estate. Subsequently, in his late teens he was hired as a trainee boiler-room attendant and lay chemist at Caroni Ltd. There he worked for twenty-two years as a qualified boiler-room technician and chemist. His thirst for knowledge was intense and was self-taught in his then career. He was well read and motivated. For some reason, his parents, brothers and sisters migrated to Poole to work in the Estates of Lyng, Prada and Bigesse, after the period of indenture. At age twenty three, after saving some money from his employment, Isahak visited his family in Poole and bought six acres of land at Lazzari Road. To the best of our knowledge the entire family settled on this land and he built a carat house. They continued working on the estate and the lands purchased. All the brothers and sisters were married during this period. Most of them worked out on their own. His brother Garib (Abdul Gulab) went to Biche where he was married. Rajali and Goolam Hosein stayed on in Poole. It was, we understand, a traditional extended family home. One must mention of the closer bond between Isahak and Sahidan, his sister and that of the other brothers and sister, Raesam. 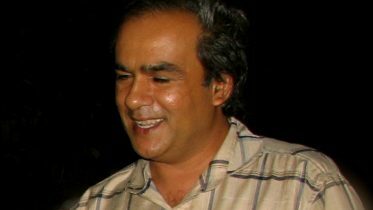 In his late twenties, he made a major decision and lefl California to join his two brothers, Rajali, Goolam Hosein and the others. Together they worked the laud with diligence, cultivated cocoa and coffee when “cocoa was King”. They were so successful they bought several parcels of land both in Poole and in far off Biche. Isahak, prior to his marriage, lived at Riverside Road, Poole and continued living there after marriage for many years. 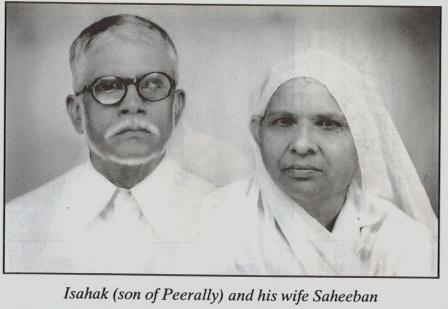 In 1925, Isahak married Saheeban from Cunaripo, the daughter of Kassim and Rasulan Khan. Together, they had six children: Acklima, Taslima, Tyab, Yacoob, Ayoub and Haneipha. Tyab died in infancy. At this point their success led them progressively to venture into the soft-drink business in or about 1928. At this time, the marble bottles were used. They were the first to use a vehicle to transport soft drinks, which they sold from Saugre Grande to Guayaguayare. Abus named “Carolina” was another enterprise, which was successfully operated, transporting passengers from Rio Claro to Princes Town. They worked all their enterprises until 1938 during the depression years, when the ‘witchbroom’ disease damaged all the cocoa trees. Isahak then started travelling to San Femando to sell provisions in the market. At this time he also scouted around and bought properties on Coffee Street, High Street and Hollis Street. Needless to say, money had to be borrowed to extend and carry on these new investments. In or about 1936 to 1938, the families of Rajali and Isahak moved to San Femando. They started trading in coals and firewood and yet maintained their activities in Poole and Biche. Goolam Hosein stayed on in Poole on the land. Isahak and Rajali became the sole suppliers of charcoal, firewood and petrocoals (synthetic coals) to the allied Army during the war. They also opened a second soft-drink factory (Red Rock, Comet and Kola Wine) in 1945. Striving on in their ventures, the two brothers constructed income producing properties, up until 1950. They all worked extremely hard under trying circumstances. His younger brother, Rajali assumed and played an increasing and beneficial role in the future development of their joint enterprises when Isahak’s health began to fail. It cannot be emphasised too much of the close brotherly ties of Isahak and Rajali throughout their lives. Isahak, self educated, was fluent in Hindustani, Urdu and English. He was also well read in Arabic and Pharsee. Isahak served as Imam of the Riverside Road Masjid which we understand he built with help from others until the merger with the Tableland jamaat. He was a stickler for Islamic discipline and moral standards whiie guiding those around him. His children all received formal education up to the Secondary level. Some proceeded further and acquired professional status. He has left a legacy which his children can be justifiably proud of and as a direct descendant of Peerally whose presence and life we acknowledge, honour and celebrate in 1998, the 125th year of his arrival in Trinidad. Isahak died in September 1956 and was buried at the Paradise Cemetery in San Fernando. His daughter, Acklima, accompanied our mother in 1983 and performed Umra. Whilst it was our mother’s desire to perform the Hajj, her physical condition did not permit this. However, in 1993 Hajjin Acklima did the Hajj on her behalf the very year our mother died. In 1997 she made the Hajj for our father, Isahak, accompanied by her daughter, Sherina, who has fond memories of her Nana who knew and loved her very much. Those of his grandchildren who were fortunate to know and be with him even in infancy in their early years also have fond memories of him. Hajjin Saheeban, his spouse, our mother, grandmother and great grandmother survived him for 37 years, died in 1993 at the grand old age of 90 years and is buried in the same plot as her husband at Paradise Cemetery in San Fernando. May Allah be pleased with them and may He bless and forgive them. They worked hard and diligently for us all. Their parenting humility and dedication to us all will always be cherished. Acklima after her secondary school at Naparima Girls High School, was married to Wahid Enatally in 1946 and had eight children. She assisted in her husband’s agricultural business and grocery store for at least thirty years. During that time she became the Post Mistress of the Charlieville area until retirement. Hajjin Acklima has acquired the reputation as a prominent and respected elder and advisor in the community. She is fondly known as ‘Mama’ and ‘Chachee’ and loved by all. She performed the Hajj in 1984 accompanied by her spouse Wahid, and since then she has visited the Holy Land on several occasions to perform the Hajj and Umra. She has nineteen grandchildren and one great-grand. Wahid died in 1985. May Allah be pleased with him and bless and forgive him. Taslima attended Naparima Girls High School and was the first to qualify with the Senior Cambridge Certificate in our family. She then became a graduate teacher and worked for a number of years proceeding thereafter to England and Scotland where through scholarship, she became a qualified midwife and public health visitor. She then migrated to Canada where she worked in that capacity until her untimely death in 1995. We all mourn her loss at a comparatively early age. She had two children, Fiona and Lara and two grand children, Natasha and Malaika. They all live in Toronto, Canada. Her husband, Inshan, survives her. She was a dedicated mother, filled with joy and humility, loved and respected by all. May Allah be pleased with her. Tyab, the third Child, died in infancy. Yacoob qualified in Law as a Barrister in London a few years after practising his profession as a Pharmacist. He attended Grant School and Presentation College in San Fernando, obtaining his Senior Cambridge Certificate. He is a graduate of Gray’s Inn, London. He served the profession also as President of the Pharmacy Board for many years and has also been involved in other cultural activities one time or another. He is at present engaged in business. He and Rhona, his spouse, have two children, Fariel and Shamshad and three grandchildren. Ayoub attended Presentation College where he obtained his Senior Cambridge certificate. He taught at Kenley’s College in San Femando prior to attending the University of British Columbia in Canada from where he qualified with a Bachelor of Science degree in 1961. He became a Pharmacist in 1973. He has successfully operated a well-established pharmacy for almost thirty years. He and his spouse, Rosemarie, have three children, Lisa, Marisa and Careema and four grandchildren. Haneipha and her spouse soon after marriage went on to England where after her training worked as a hair stylist. Prior to this she had her secondary education at Aquinas High School in San Fernando. She now resides in Canada and qualified in beauty culture, her chosen career which she now practises. She has three children, Reza, Sheraz and Savi. Be the first to comment on "The life and times of Isahak"